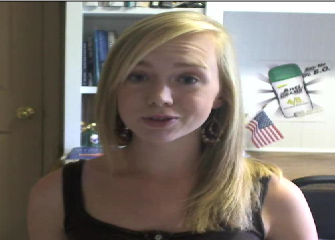 Why was this young 16 year-old’s innocuous video, which simply expressed her personal views on traditional marriage, dumped by YouTube? Could it have been that in just one week the video had garnered over 20,000 views and was well on its way to going viral? Was YouTube frightened by the sincere words of an intelligent teenager who offered a very different glimpse into the hearts and minds of young Americans as opposed to the gnarly image the media moguls want us to see? Watch Madeleine McAulay’s video over at Breitbart and see what you think. Did this young woman deserve the message she received below? And what ‘community guidelines’, pray tell, did this kid violate? Interesting that YouTube seems to be totally unaware of the outrageous crapola cluttering their site—yet somehow they have managed to zero in on Madeleine’s personal testimony. 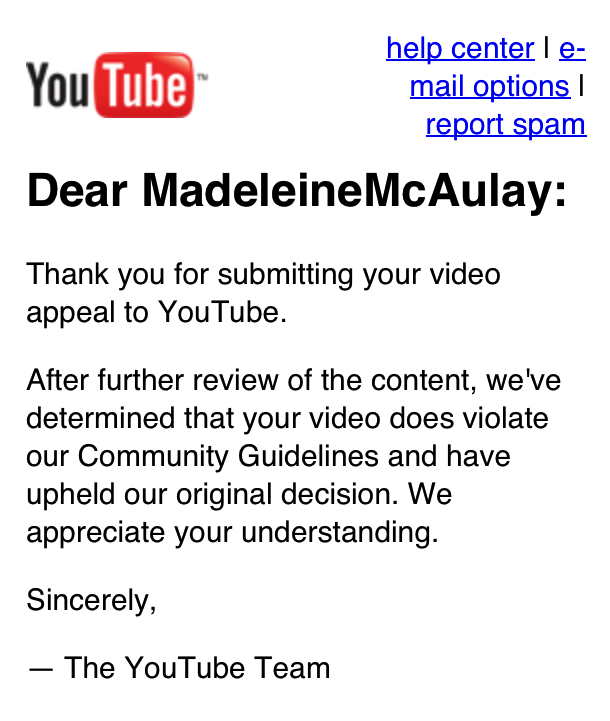 YouTube obviously targeted Madeleine’s video because it was getting noticed. And of course, the progressive media’s agenda is to attempt to shape public opinion by filtering out any message, any image that counters the party line. This entry was posted in Media/Arts/Entertainment, Political/Social and tagged gay marriage, Madeleine McAulay, media, traditional marriage, video, YouTube. Bookmark the permalink. Thats bull crap! All the fags put all their crap on there, with their opinions.. But someomeone else cant express theirs?? Shame on you tube!! Youtube sux!!!! It’s chilling that You Tube rejected this and took it down, but not as chilling as if the government owned You Tube. Wait – does the government own You Tube? Chilling is the word. Alternative media is great, but it’s just the beginning. We need to make big inroads into social media, otherwise we’re forever playing in the enemy’s sandbox. If I had to like all gay people, well, um, well, never mind. . . I love cats. There is nothing better than a kitty, but that one that sits under my bird feeder gives me a pain. And the ones with all that long hair I can do without; and the ones with no hair at all aren’t too neat, either. The ones with those folded ears aren’t cute to me; and I do like a cat to have a tail that whips around when they are annoyed. I like a kitty I can pick up and hold like a baby when I get the urge and it will purr, not want down immediately. Yes, I love cats, but not all cats. Just like Madeleine McAulay! She probably really likes people, but not all people. I certainly don’t like all gay people; why are they making Madeleine like any gay people? It’s her freedom and her right and I don’t believe in gay marriage, either. Right-on, Madeleine! I love cats, but I don’t have any. This kid has every right to be heard and if her video had only gotten a couple hundred views it would have bee left alone. YouTube could then claim they have no political agenda (yeah, right). But as soon as it took off and was going to be viral they dumped her. They should be ashamed of themselves. And yeah, I too have a mixed reaction to pets. I had a cat for many years and we had a love/hate relationship going–he needed three large litter boxes to do his business each day, destroyed every curtain, coverlet, and blanket I ever had, howled for hours if left alone for an evening, and of course would only eat the most expensive cat food on the market. After he died, I never got another one.